The World's Fluffy Small Breed Dogs: Which one is right for you? aaa-paragraph identifier. Use the box when you Preview the page, and then remove it when you Build the page. Each single paragraph shows as a blue box, with a blue border and light blue background. If the blue box is more than a couple of sentences long, spilt the words up into smaller paragraphs. If the breadcrumb boxes (green or orange) are very long, (much longer than they should be), it means the closing tags are missing, and no Google Auto ads will show in the box. 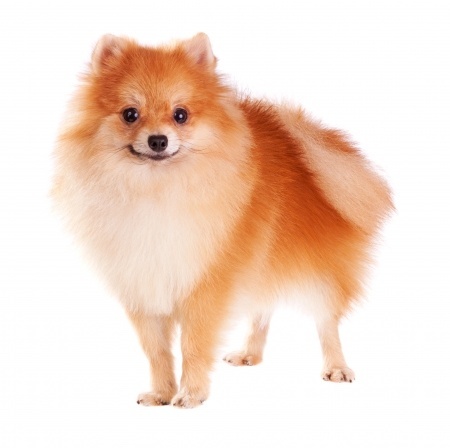 Fluffy small breed dogs seem to be getting more popular these days and we wanted to know why. According to the American Kennel Club, the most popular breed in the U.S. is the Labrador Retriever, neither small nor fluffy, but when you clump fluffiness into a category of its own, the cuteness factor clicks on, and people's hearts begin to melt. All these dogs share few factors in common with each other. The breeds originate in different countries, their personalities vary widely, and their care and grooming needs are even different. But what they do have in common is their size and length of hair. All are small, many very small. They have hair that grows often without much shedding involved making them very hairy dogs. But what distinguishes them as a unique group of canines? It is the tendency to cause humans to go into a cuteness overload, which we have not been able to find a cure for as of now. There is a downside. When people fall head over heels in love with fluffiness, their sweet fluffy small breed dog begins to feel they just might own the world. Without socialization and training, some of these dogs are destined to becoming victims of Small Dog Syndrome. Of course, this is not a genetic problem, but a people problem, so if you decide that one of these fluffy small breed dogs will be your next best friend, be sure to include time in your schedule for a little training and socialization. 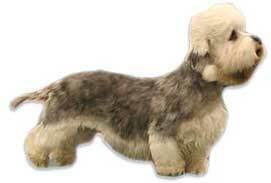 These fluffy small breed dogs are listed in alphabetical Order. We don't want to be accused of playing favorites to any of these fluffy small breed dogs. It hard not to love them all! 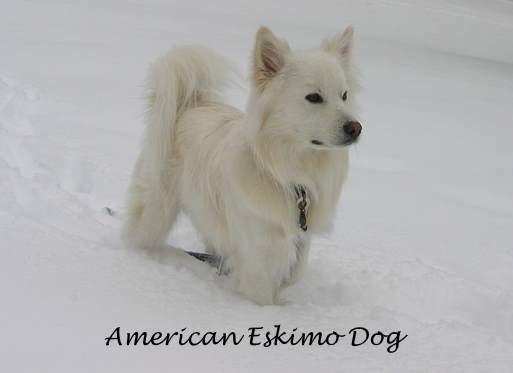 The American Eskimo Dog comes in three sizes, but the one we feature on this site is the toy version which 9–12 inches (22.9 – 30.5 cm) and 6–10 lbs. (2.7-4.5 kg.). Eskies as they are often called were once circus performers because of their high intelligence and ability to perform. Today, they make loyal family companions who excel in problem solving tasks. Their long thick coat is comprised of a dense under coat and a straight outer coat. Brushing is necessary because these dogs do shed and frequent brushing helps keep some of the hair from covering the house. 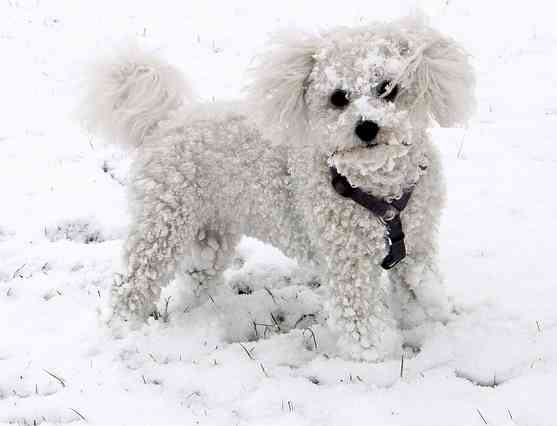 For the fluffy dog lover, the Bichon Frisé may be the Pièce de résistance. With all that hair and large dark eyes, a Bichon puppy is irresistible. Gentle, affectionate, and cheerful, these dogs love everyone. With all that charm and good looks, what more could you want. Well, for one, they are also intelligent and clownish making them a great choice as a family dog. But someone in the family will need to take over the grooming tasks, as these fluffy small breed dogs need daily brushing to stay looking great. White dogs also sometimes have problems with tear or face stains, so be prepared to deal with that too. Overall, they are a great choice. Is it real or just a stuffed dog? Sometimes it might be difficult to tell. They have a plush thick coat, round dark eyes and a button nose making them a picture perfect rendition of a sweet stuffed toy. But they are not stuffed, at least not with the materials normally used in toys. Rather, they are stuffed with personality, charm, and intelligence. 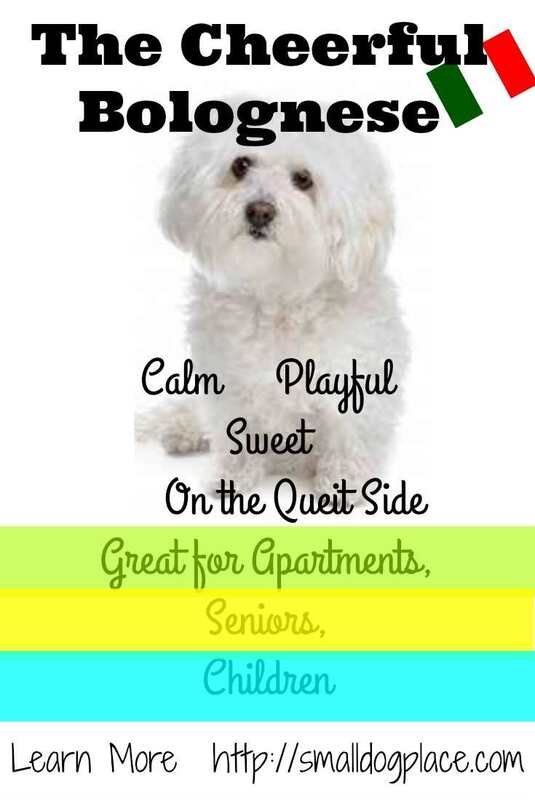 They are less active than most fluffy small breed dogs which make them perfect for apartment living. But that plush coat does require some work, so purchase a few good brushes, and get to work. This is much controversy about these dogs. 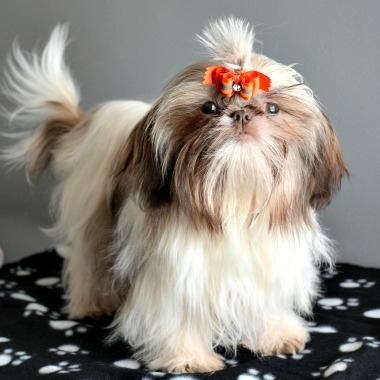 In one camp are the Shih Tzu breeders that say the Chinese Imperial is just another Shih Tzu dog who might be the runt of the litter. On the other side are breeders who breed only small size Tzu in the 3 to 8 pound range. Is there an Imperial gene? No one has proven it but there are certainly plenty of very small Shih Tzu dogs out there doing just fine. If you want small and fluffy, these might be the dogs for you, but expect to pay a high price, as they do not come cheap. You cannot get much fluffier than a Coton. The texture of the hair is cottony soft and if you want something wonderful to touch and pet, the Coton should be your choice. But do not pick a dog just because he is soft and cottony. Luckily, the Coton offers much more to his owner than his amazing coat. They are a sturdy breed who loves to romp and play, snuggle or just plain sit and try to figure out their owner. They make great pets, but beware; they are still very rare, at least in the U.S. so it might take some time to find the one of your dreams. 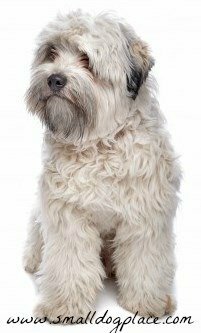 One might not think of a terrier as being “fluffy,” but the Dandie is different from most terriers. They also make wonderful family pets. They are smart, loving, and loyal, but expect to look long and hard for a puppy. Their price may not reflect they rare status, but at least in the United States, they are very hard to find. In fact, you might go a lifetime before you ever see one out and about. Still, you might want to add this to your fluffy small breed dogs list to check out. Here is a winner if you are looking for a family dog with a big personality. They get along with everybody including other pets. While not yappy, they will alert you if someone comes to your door. They are intelligent and need some stimulation to stay out of trouble. Even though they are small, they are sturdy and gentle. With all that fluffiness comes some grooming, so be prepare for brushing, combing, and everything else that goes along with owning a fluffy dog. A highly sensitive dog, these dogs bond closely with their owners and make the perfect loyal companion. 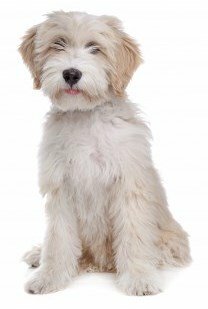 As an adult they have a wonderful thick coat, but it takes a while to grow it all in so do not expect the puppy to be as fluffy as say, some of the other breeds mentioned on this page. They do shed and brushing daily is recommended to keep the Chin looking his best. These are quiet dogs and do great in apartments, but they still enjoy a daily walk. Since they are not a common breed, it might take longer to find the puppy of your dreams, but the wait is well worth it. Just a quick look at the Japanese Spitz and you'll know why we added this pup to our list of fluffy small breed dogs. Intelligent and energetic, the Japanese Spitz makes a great family dog. They love to please and will remain loyal to all that love them. 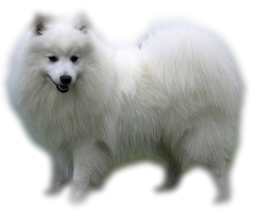 They sport a thick coat, as is the case with all the Spitz breeds that has a dense undercoat and straight outer coat. Much brushing is needed as these dogs do shed. Be prepared for hair around the house even with the daily brushing and combing. But, if fluffy is what you want along with an amazing family dog that does very well with children, this might be the breed for you. Here is a highly adaptable dog that loves the creature comforts of life. They do not need much exercise but appreciate a daily walk. They love their families and try to please so training as long as it is positive can be very rewarding. They are a little wary around strangers. They use their keen sense of hearing to alert you to anyone who comes nearby. For these reasons, they make excellent watchdogs. As far as the fluffy factor is concerned, they have their fair share, which means daily grooming to keep those locks looking good. If you are looking for a clown or a built in entertainer, this might just be the perfect breed for you. They love being in the limelight and just in case you might be busy doing something else, they will help you remember that they are there ready to entertain and be entertained. Dubbed the little lion dog, because after having he classic cut for this breed, they resemble a lion, mane and all. Prepare to groom, as they are fluffy and do best with a daily brushing. 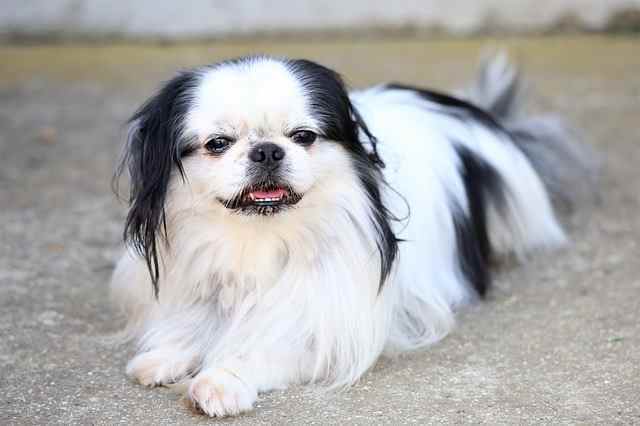 A real charmer in a tiny body, these dogs are happy to be by your side, on your lap or sharing your pillow at night. 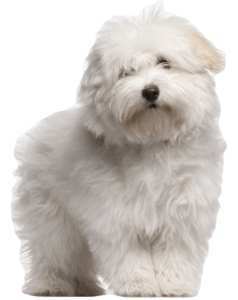 They are fluffy and with all that fluff, you will need to spend time grooming: brushing and combing to keep mats at bay, but most Maltese can be trained to enjoy grooming if the training starts early. Since they are tiny, the best homes for these pups are with families with older children, couples, and singles. 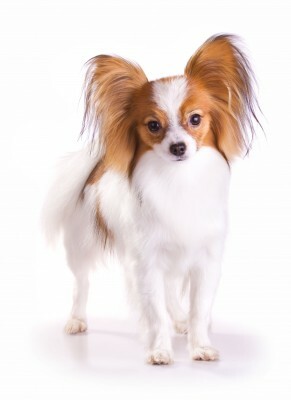 Papillon means butterfly in French and my guess is that the breed’s amazing ears had something to do with their name. Does the Papillon look like a butterfly to you? It must have resembled one long ago, as this is how they got the name. They are friendly, outgoing, and happy with some energy to spare. There will not be a dull moment in a household owned by a Papillon. Most owners state that they never outgrow their puppy years when it comes to playfulness. With all that charm and fluffiness, where can you go wrong! Since they have a single coat, they maybe just a little easier to groom, but still plan on regular brushing to keep mats away. I do not think it gets any fluffier that this! They look like royalty and display an aura of nobility, but then they have been bred for centuries to be a companion dog. They are loving, sweet and affectionate to their families but also wary of strangers making them good watchdogs. 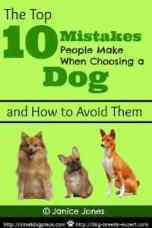 A little unpredictable around children, these dogs are best for families with older children, couples, and singles. Grooming will require some of your time, but because they do not require too much exercise, you still have time left over for some fun and games. These little fluff balls are the happy go lucky fellows of the canine world. They are energetic, bouncy and crave attention. If trained early their tendency to be yappy can be reduced and because they are a highly intelligent breed, training maybe easier to accomplish. They are fragile, so they might not be the perfect choice for families with small children, but with owners who understand them, they are very loyal, and can spend hours on your lap if you allow it. Prepare for a little wrist action with your brush, though as their fluffiness needs attention daily. 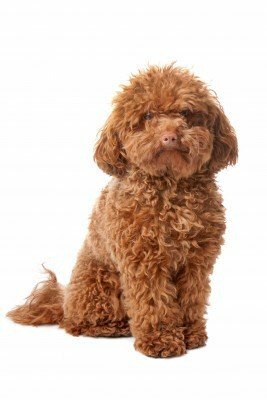 The poodle does not have to be fluffy if you choose to keep him clipped short, but with a body of hair that continues to grow and grow, you will spend a lot of time at the groomers. That curly hair can be blown dry and brushed with a slicker brush to achieve one the fluffiest dos in all of canine-dom. 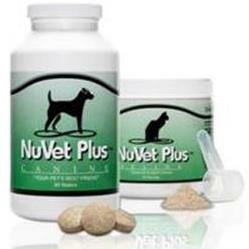 Think Poodle Show Dog, if you can't understand why we added this to our list of fluffy small breed dogs. Some owners prefer the groomer route so they have more time to play with, exercise, and train these remarkably smart dogs. Of all the fluffy small breed dogs, this one might be the rarest, at least in the United States. These spunky dogs can satisfy most of their energy needs indoors eliminating the need for a large backyard. They are intelligent and sociable and make great lap dogs. They come in a wide variety of colors and according to the standard, any color But white is permissible. Their coat is long, soft, and wavy to curly. 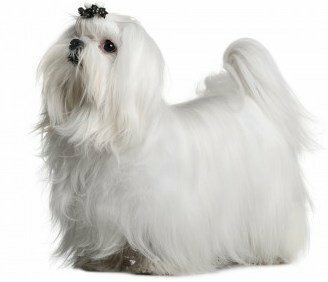 They require regular brushing, but the grooming requirements of this breed might not be as great as some other long coated small dogs. These dogs are considered a rare breed so please be forewarned: There might be an extensive wait to find the perfect puppy and most come with a hefty price tag. 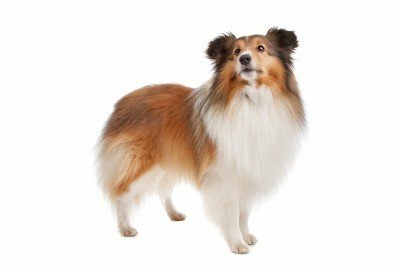 If you think you want a fluffy small breed dog, the Sheltie might have what you want. Fun loving, devoted, and smart are three words to describe the personality of a Sheltie. They may look like a miniature collie, but they are breed of their own. They are a good choice for a family and thrive in a suburban or rural setting. Being a little yappy, they may not be perfect for apartment living. They fit the bill of fluffy because they have a thick double coat that consists of a harder outer coat and soft inner layer that does mat easily if not brushed. They usually shed about once per year; when this is happening, daily brushing is necessary to control all that hair. In the meantime, a good brushing with a pin or slicker brush and an undercoat rake works well to keep them looking their best. 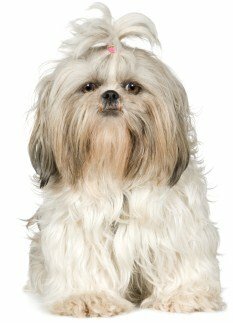 Perhaps one of the most popular fluffy dogs, the Shih Tzu provides their owner with the fluffy cute look but does not stop there. Personality plus! These dogs are sweet, devoted, playful, and sturdy. These fluffy small breed dogs will warm your lap as they stare into your soul with their large round eyes. 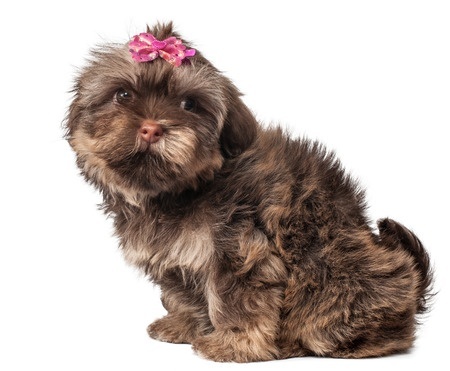 Most Shih Tzu dogs have a stubborn side, but if you find the appropriate motivator, you can easily train most of them to basic commands and more. Be careful where you purchase one, though, as health issues have surfaced because of their popularity due to over breeding. 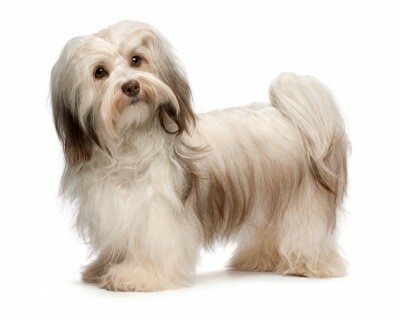 Tibetan Terriers resemble miniature versions of the Old English Sheepdog. Although not as small as most breeds featured on this website, they are small enough to be mentioned, weighing in at between 18 and 30 pounds. (8 to 14 kg). They have a moderate to high energy level so daily exercise is a must, but they are sociable and gentle, almost laid back in temperament and make great family pets. 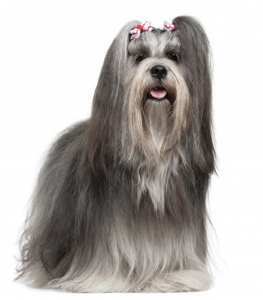 Their double coat consists of a thick warm undercoat and a top coat that is soft with the texture of human hair. Once a puppy’s adult coat grows in, they need regular grooming, brushing, and combing to prevent mats from forming. So, this is our list of fluffy small breed dogs. What do you think? 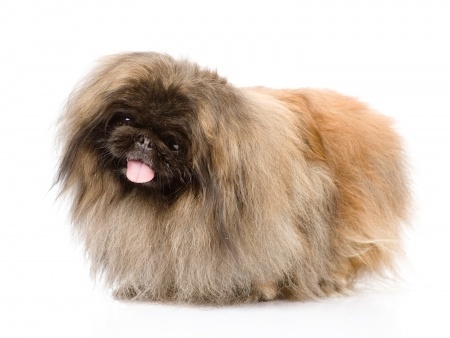 Do you own one of these fluffy small breed dogs and want to tell us about your pet? Do you have a different fluffy small breed dog that we forgot to list? Tell us too. Use the form below to tell the world about your fluffy small breed dogs.